here is nothing new under the sun - as the old adage goes. And when looking at the sleek new industrial buildings built out of state-of-the-art new materials such as carbon fiber or indeed, boring steel and concrete, it is surprising to see the renaissance of construction with wood – something I thought had disappeared for traditional city building. There is nothing new under the sun - as the old adage goes. And when looking at the sleek new industrial buildings built out of state-of-the-art new materials such as carbon fiber or indeed, boring steel and concrete, it is surprising to see the renaissance of construction with wood – something I thought had disappeared for traditional city building. My brother who operates a sawmill fed by managed forest plantations always swears to the integrity and magnificence of wood in construction but that would seem to be confined to cute little log cabins in the mountains. Wood certainly has a long history in construction. But has a somewhat patchy history for durability. One only needs to think of the Roman Empire with buildings made of concrete, rock and masonry to see their sustainability for thousands of years (apart from groups such as ISIS destroying the 2000 year old buildings in Palmyra) as compared to that of the subsequent Barbarian tribes who built weak hut structures out of wood that were lucky to survive a generation. New techniques today mean that wood can be used for taller buildings with considerably higher levels of stress. A 14-storey block of flats in Bergen, Norway was recently constructed out of wood. Closely followed by an 18-storey building for the University of British Columbia. Some are even talking of wooden skyscrapers in Stockholm. Apart from the beauty of wood, the weight of a wooden building is about a quarter of that of a traditional concrete one. Wood is a natural carbon sink against that of the huge carbon footprint for steel and concrete. Cross Laminated Wood comprising layers of wood glued together at right angles to each other results in a hugely strong structure with great rigidity. 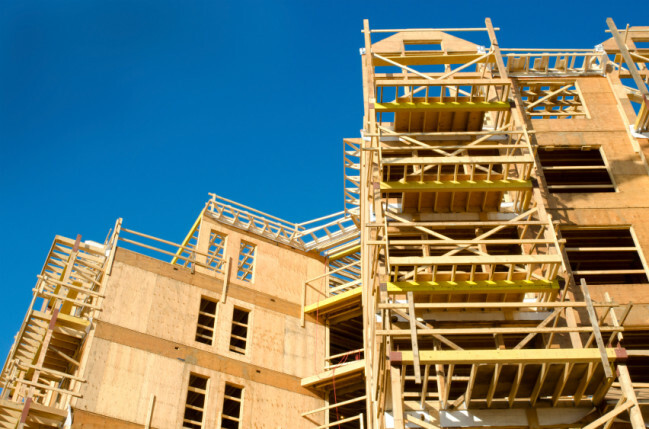 Construction using wood is considerably faster than for concrete and it is also a quieter process (no pile drivers/concrete pumps and steel welding). Everyone has concerns about the ease of wood burning but a thin layer of concrete added to the wood means it is less likely to burn. Huge chunks of wood are also difficult to ignite. So this means the major problem of fire can be overcome. The only slight glitch is that various country’s building codes are not always encouraging in the use of wood for major structures. But this situation is changing due to public pressure. Old approaches and materials should always be considered when looking to the future. Never reject something because it is considered too old to be useful. Including people. Peter Zumthor noted with wood: You feel a certain way in a glass or concrete or limestone building. It has an effect on your skin - the same with plywood or veneer, or solid timber. Wood doesn't steal energy from your body the way glass and concrete steal heat. When it's hot, a wood house feels cooler than a concrete one, and when it's cold, the other way around. Thanks to the Economist for an interesting article on wood.